The Building Performance Institute (BPI) has announced a set of rule changes that will take effect on February 1, 2012 as part of the process to become accredited by the American National Standards Institute (ANSI). ANSI accredits standards developers, certification bodies, and technical advisory groups to both the International Organization for Standardization (ISO) and the International Electro-Technical Commission (IEC). By achieving ANSI Accreditation, BPI’s goal is to ensure that their energy-audit standards for residential homes are well respected, recognized and effective. ANSI Accreditation will validate BPI standards through third-party verification. 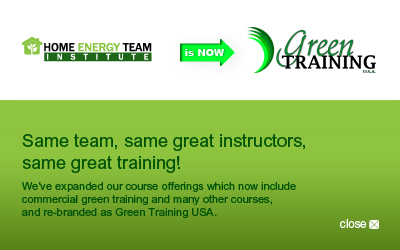 What Does This Mean for Green Training USA? As of February 2012, new BPI requirements and fee increases will necessitate the following changes to our BPI training courses and certification exams. If you register for any of our BPI courses before January 5th and complete your exams by January 31st, you can avoid the increased fees. See course package prices below. What Does This Mean for You in the FUTURE?